Some of my earliest memories as a kid were of my father taking me to Devils' games. Even without his throw-back nickname, his flamboyant and fun-loving demeanor and the famous goal post-kissing scene after recording a shutout against the Pittsburgh Penguins in the 1975 Stanley Cup Playoff quarterfinal series, Chico Resch unknowingly made me a fan for life. 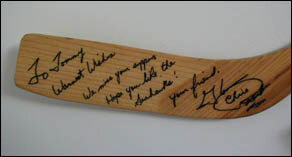 My father's best friend's boss happened to live next door to Chico and through a series of favors, I was given a hockey stick with a personalized autograph. To this day, more than 20 years later, the stick is one of my most prized possessions. Over the years, my devotion to Chico and the New Jersey Devils evolved into what can only be described as fanaticism. Although I have lived in several states, and currently in New York, I have always remained a loyal fan. All of this despite my father and brother siding with the dreaded cross town rivals. I rarely miss a game on TV and I get a kick out of seeing/hearing him broadcast the games. Although I have bought countless Chico related items since then, nothing can compare to the stick I got for free! I created this page as a way to try to thank him for taking the time to make a five year old's day!